Over the last couple of years I have somehow become known as a guru of hammock camping. I don't want to end up as a guru because it inflates some folks heads, but I don't mind giving advice. Just understand as you read all this stuff, I'm not always right, and sometimes what works for me doesn't work for others. When I started using a hammock back in the 80's, there was only the Army surplus jungle hammock and the various mesh survival hammocks which you could rig up to suit yourself with poncho/tarps, bug nets, etc. I loved using a hammock, but it wasn't always the sleeping system of choice. 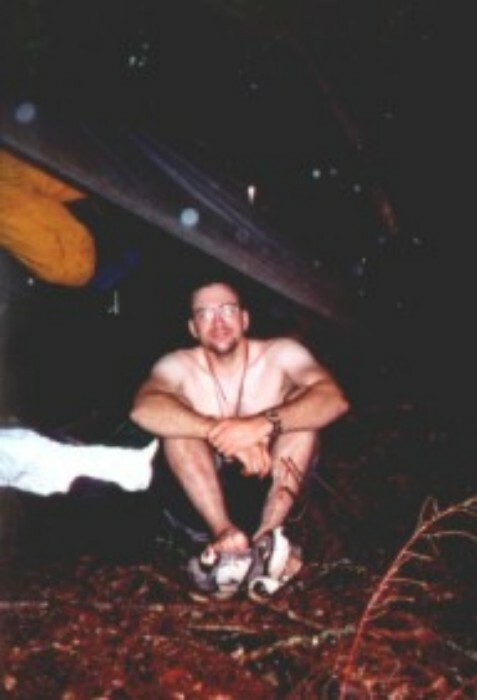 In 2000 I was looking for a lighter shelter than a tent for backpacking. I was looking for maybe some tarp or light tent but hadn't made a choice. 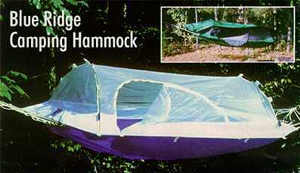 I was stationed at Fort Polk and had been using a net hammock with a poncho as a shelter when in the field and was very pleased with using them except for the bug problems, which can be annoying for a place like Fort Polk. 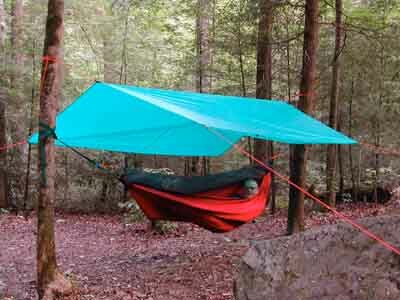 Picture From Clark Jungle Hammocks. 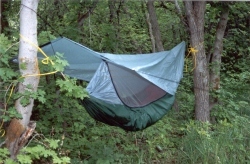 One day while surfing the internet I found a review on The Lightweight Backpacker for a Clark Jungle Hammock Ultralight and seriously considered getting one. I did some research and found the Hennessy Hammock and after some comparisons went with the Hennessy. Mainly because of price and weight. Since then I have acquired three Hennessy Hammocks and continue to test and try hammocks from any manufacturer I can get my hands on. * Denotes a hammock I have tried. The reasons to hammock are not always clear to people that have never tried one. Often I get comments about how a person hates sleeping on their back or can only sleep on their side, or how sleeping with that curve will wreck their back, or even how they don't want to damage trees with the cords. All these are valid concerns, yet each are simply the worries of the uninformed, similar to family fears we hikers are all in danger of getting eaten by bears daily. 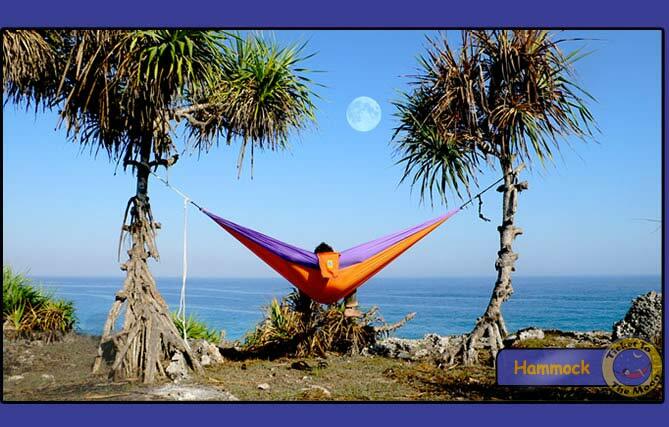 First of all, a properly hung hammock will allow you to sleep on your side or back without a curve. 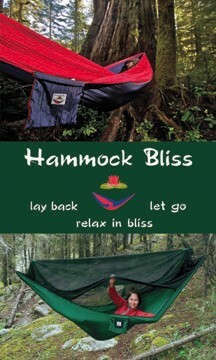 Most hammocks I have tried (except for the Clark) allow you to sleep at an angle to centerline. Sleeping about 10-20 degrees off the center allows you to lay flat. 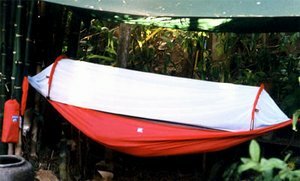 This is the technique used by the south and central Americans who invented the hammock. 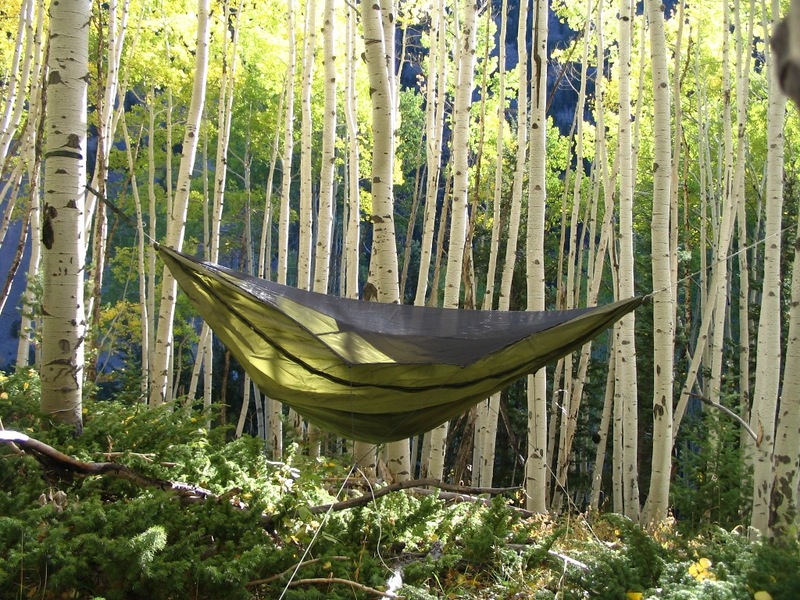 The Clark uses more of e pea pod style hammock to keep you in the bottom and flat. But the main point is you can sleep on your side. But even if you can sleep on your side, after a while you may decide not to. After a few days on the trail in a hammock, that natural slight curve becomes your friend. The tired knotted back muscles relax extremely well sleeping in that curve, and after getting used to it, you will prefer it. Often I find he transition into the hammock after a long break from the field is fairly easy, but getting used to a flat bed after a few weeks in a hammock is actually harder. Another point about sleeping like this. When you can elevate your feet above your body, it helps to reduce the swelling that sometimes happens overnight after a good hard day of hiking. Honestly, the comfort is the number one reason to switch and can't be emphasized enough. It is way more comfortable than any pad out there including the self inflating pads. Besides supporting you back, relaxing your body, and reducing foot swelling, there is the gentle rocking that can lull you to sleep, as well as the lack of mystery bumps like rocks and roots that you think are not there until you lay down to sleep like there is sleeping on the ground. You don't slide to one end of your hammock like sometimes happens in your tent when you can't find the perfect level spot. As for damaging trees. Hammocks are actually some of the lowest impact hiking systems out there. 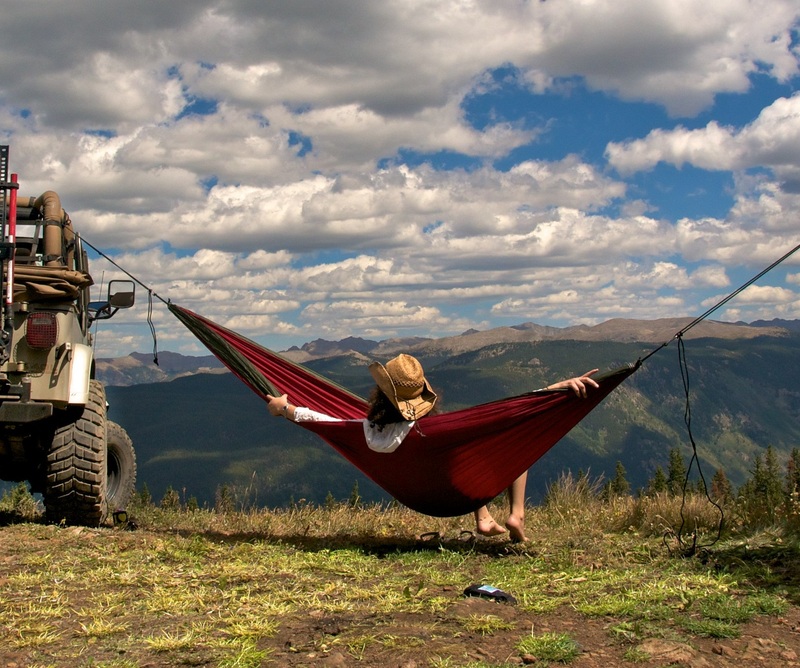 Instead of grooming a flat spot or compacting earth, a hammock keeps you above all that. Tree bark can be protected by either flat straps similar to Hennessy Hammock Tree Huggers, or by using a rope system that uses multiple wraps to distribute the load that keeps the rope from digging into the trees. In fact, the biggest problem with a hammock is actually staying warm. More will be covered on this later. 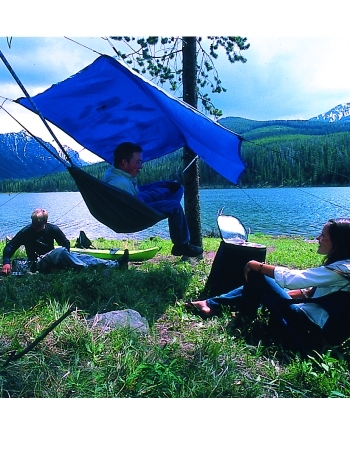 The benefits to hammock camping besides comfort and low impact are quite a few. The main ones for me are site selection, weight, and flexibility. 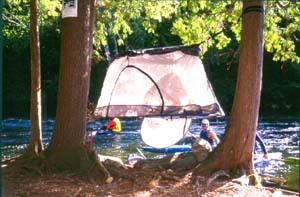 The number of camp sites when you use a tent or tarp are limited to the places where you have flat ground, no pooling of water, no runoff flowing through, clear of brush, clear of rocks and roots, and many other little things to make your sleep enjoyable as well as just supporting the structure. Many times you must either crowd into a limited number of spots with others, go to designated sites, create a site (increasing impact), or take a less than perfect site. With a hammock, it's almost all good. When you have a hammock, your campsites are limited by imagination. All you need is a couple of trees the right distance apart. What is under you may not matter at all. I have personally slept on the side of a mountain, and on the Hennessy web site, there is even a photo of a guy sleeping over his boat in a swamp. There are things that make better camps than others, and some safety things to consider, but unless you are camping where there are no trees, then the hammock will increase your camp sites. I also say weight because I select hammocks that are low on weight. Even the biggest hammock I have tested (the Hennessy Explorer A-Sym) weighs less than the standard solo tents. There are some hammock models out there that weight a lot more, but that is your choice as what to carry. But the absolute lightest camping hammock with bug protection and rain fly is less than a pound, the absolute lightest tent that gives bug protection weighs twice that. And as for flexibility, well my hammock serves as it's own vestibule (see tips), chair, lounge, gear loft, solo tent, and of course - a hammock. A tent is always a tent. Hammock Wiki A collaborative on-line resource attempting to collect everything there is to know about backpacking hammocks.